My name is Panos Kanatsoulis and firstly, welcome to The Clumsies. After ten years in the industry I still value hospitality and creativity above all else. My first job was in a club in Athens while I was studying fine art conservation. After I finished my degree I worked in small bars in Athens. I was considering becoming a chef, but I realised bartending was just as creative. A chef works with fire, whereas we work with ice. I then moved to Dubai for a change and worked at Zuma with Jimmy Barrat for three years. When I came home I knew all the guys at The Clumsies, so worked at their mezcal pop-up bar before starting at The Clumsies full-time. 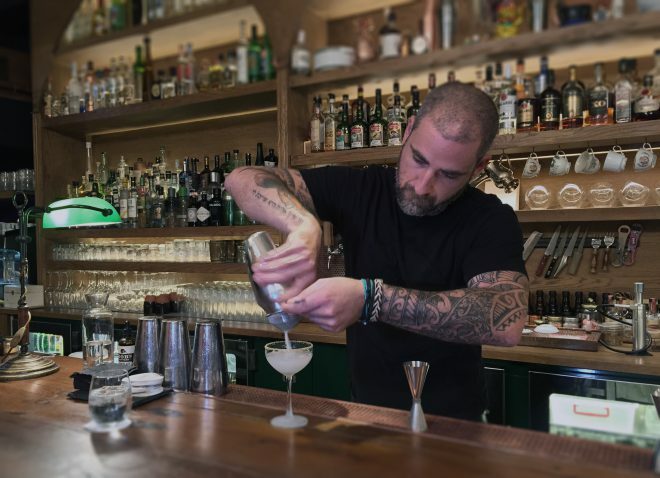 It’s a great time to be in the bar scene here, I feel like Greece has really put its stamp on the cocktail map. I would want it to be exactly like The Clumsies, because it feels like home. Let’s call it The Clumsies II and I’d make it in New York. It would have the same layout and look, with the large open area downstairs and the small private bar upstairs. The only difference would be I would like rock and roll music, as I love seeing people dancing and having a good time. We work such long hours, I like to chill and watch movies. I like the character of gin as it’s floral and aromatic and you can play with it a lot in drinks. My favourites are Monkey 47 and Tanqueray 10 because it’s very delicate. For me a good cocktail is simple, uses quality, local products and has The Clumsies touch. I can’t tell you what that is because it’s a secret. I also love bubbles, we carbonate quite a lot here. I enjoy using products from my country. Ingredients like olives, mastiha, thyme, olive oil and rosemary and creating homemade products with them… everything from cordials to bitters. Go to Odori, a vermoutheria around the corner and see Manolis. Also see Adam Hrapko at Zuma New York and Agung Prabowo AKA Papa Charly, from Lobster Bar and Grill who is general bar manager of Shangri-La in Hong Kong. This is our last interview for 2016. We would like to thank all the wonderful bartenders we’ve interviewed and thank you for sharing your drinks with the world. Wishing you all a healthy, happy and cocktail-filled holiday season. We are off to Asia, so stay tuned for lots of exciting interviews next year. We will be back online the 12th of January with an interview from one of London’s favourite bartender hangouts.